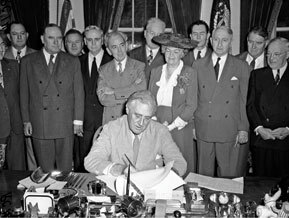 On May 11, 1935, President Franklin D. Roosevelt signed an executive order establishing the Rural Electric Administration (REA). Stanton County Public Power District was organized in 1936 and distributed its first kWh in 1938. Stanton County Public Power District is a not-for-profit political subdivision of the State of Nebraska. Lines were built in rural Stanton County and energized in May 1940. Initially, 174 consumers were hooked up. SCPPD began serving the City of Stanton in 1976 and the Village of Pilger in 1987. In the early years, Managers and board members spent time talking with the customers and potential customers and informing them of the benefits of electric power. Manager Fred Ball and project coordinator Mark Colborn were extremely involved in this building process. As customers became aware of the benefits of electricity and the Public Power system, SCPPD began to grow. We now service over 2,700 customers on 770 miles of line. In order to keep our reliable energy moving to your homes, our linemen maintain our continually system and make improvements as needed. We strive to serve our customers with safe, reliable energy every day. As the electric industry evolves to meet the needs of its customers, so has Stanton County Public Power District. Families, farms and businesses have become very dependent on electricity and the expectations of reliable power are higher than ever before. In the early 2000’s, an Advanced Metering Infrastructure (AMI) was installed to read meters and monitor reliability. An advanced Supervisory Control and Data Acquisition (SCADA) system was installed to monitor the electric system. These new programs will give SCPPD the ability to find problems within the system more quickly and get your power restored sooner. The AMI system will also give SCPPD staff more data on your metered usage to help solve high energy usage issues and promote energy efficiency. In 2014, Stanton County Public Power District received significant damage to the system due to multiple tornadoes ripping through Stanton County. A majority of the damage was done in the community of Pilger. Several homes and business were destroyed or damaged. The lines feeding the community were destroyed as well. Many crews from neighboring Districts assisted in the rebuild of the electric system. Many years later the community continues to rebuild and has persevered through this tragedy. Nebraska is the only state in the nation whose electric distribution system is 100% publicly owned. Local control and reasonable rates are some of the primary advantages of public power. Reliability is at the core of our business model. We understand the importance and reliable energy and strive to deliver. Reliability may have a different meaning to each customer, but regardless, it is the core of what we do at SCPPD. We strive to keep your lights on! Customers control the District which means local control and low-cost electricity for consumers. A Board of Directors is elected during the general election. These directors live in the district and protect the rights of the customers they represent. Because there are no stockholders, Stanton County Public Power District is continuously reinvesting in the system. There are no returns or dividends built into your electric bill. For more information view the Nebraska Power Association website.